Today, NVIDIA is announcing the Shield tablet. While normally such launch announcements don’t require much in the way of exposition, NVIDIA is in an odd place. Last year, the Shield portable and Tegra Note 7 were the primary mobile devices shipping with Tegra 4. In hindsight, the Shield portable was a bit too niche to ever reach mass adoption. It was first and foremost a gaming device, with a display attached to a controller as opposed to a controller attached to a display. The result was that while it was surprisingly good for gaming, it wasn’t the best tablet. It really only worked in landscape mode, the display size was relatively small (5 inches diagonal), and using the touchscreen was an awkward experience. The Tegra Note 7 was NVIDIA’s attempt at competing in the mainstream tablet market. While the dual front facing speakers and stylus were good advantages over the Nexus 7, it wasn’t clearly better than the Nexus 7. 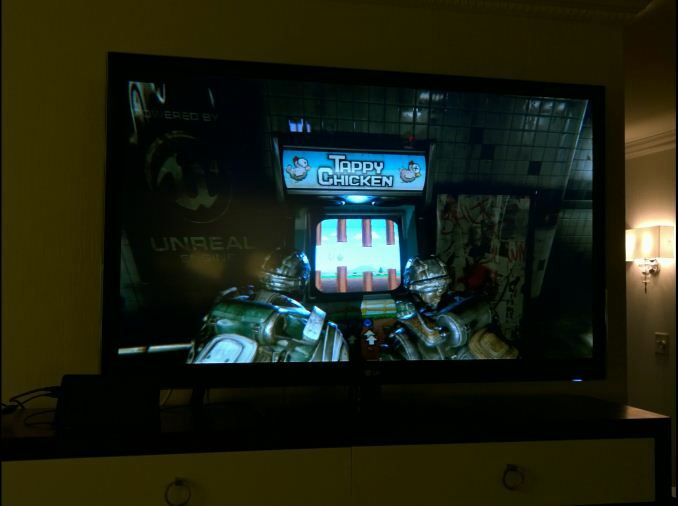 The display was lower resolution, lower contrast, and not as well calibrated. The WiFi module only supported 2.4 GHz, and there was only a gigabyte of RAM. While it was possible to emulate a Shield-esque experience with the Note 7, there was no game streaming from PC to tablet due to the lack of 5 GHz WiFi, and the controllers on the market simply weren’t as good as the controller in Shield. In addition, because the Tegra Note 7 wasn’t directly controlled by NVIDIA the experience in software update speed could vary. From the lens of past experience, the Shield tablet makes a lot of sense. 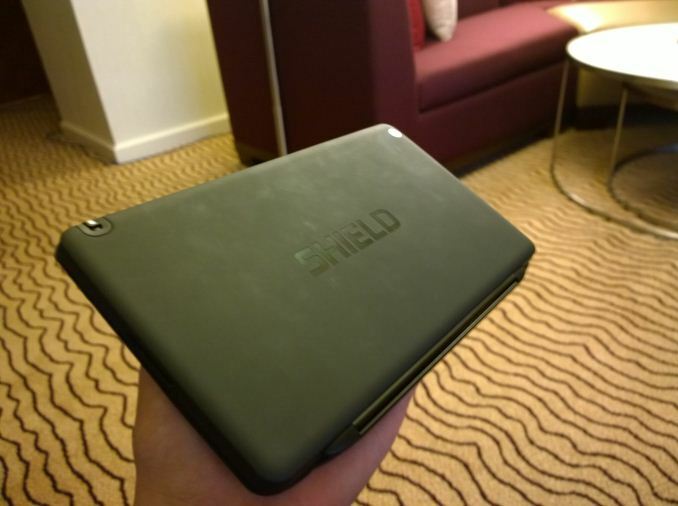 The specs are right for a good tablet, but it’s also a proper Shield device. 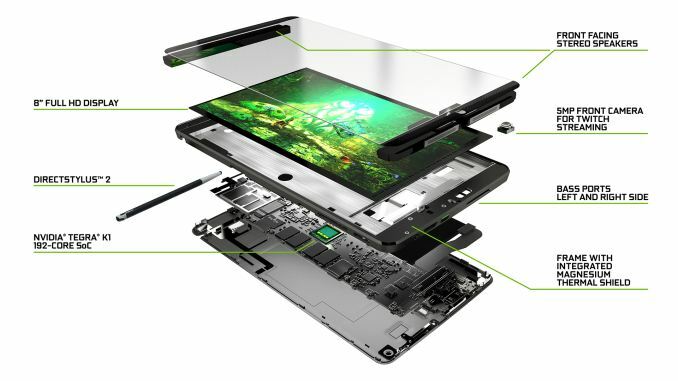 As a tablet, it has all the right pieces. A high resolution display, Tegra K1 (Cortex A15 variant), dual front facing speakers and bass reflex ports, a new stylus, 5 GHz WiFi, and a 5MP front facing camera. I’ve put a table of the specs below for easier reading. In the stylus side, DirectStylus 2 is said to reduce the inking latency to half that of the implementation we saw in Tegra Note 7. In practice it seemed that the stylus latency was low and lines tracked closely to the stylus, but I’ll avoid final judgment until the review. NVIDIA also claims that there are more levels of pressure sensitivity, but it’s not quite clear how many levels there are. NVIDIA has also added handwriting recognition software, which worked relatively well in some casual testing. The Dabbler application also seems to provide a relatively realistic simulation of various physical mediums such as oil painting and watercolor, although it’s mostly targeted towards artists. In addition to the stylus features, NVIDIA is advertising 1080p Netflix support. Normally, due to the DRM restrictions associated with high bitrate streaming, most Android devices only support low resolution streams. NVIDIA has done all of the necessary work to satisfy these DRM requirements, so it supports the highest bitrate available to mobile devices. Of course, this feature will be disabled with an unlocked bootloader, but it’s a good feature to have for mobile streaming. 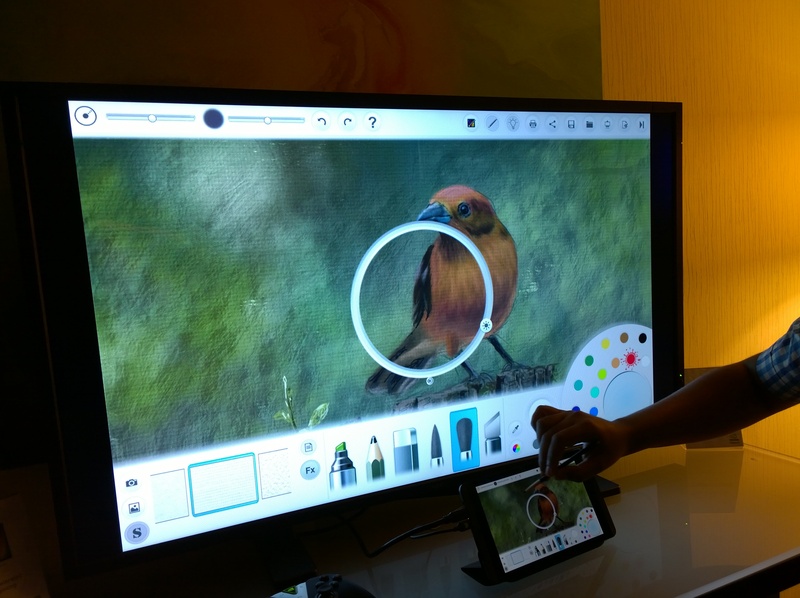 Outside of tablet features, the gaming features seem to be quite compelling. The controllers themselves were comfortable, and were very similar to the Shield portable’s ergonomics. NVIDIA is emphasizing that these controllers connect over WiFi direct, and the frequency selected depends upon the network that is used. The result is much lower latency, and NVIDIA is also able to run a headset jack and microphone through the controller due to the higher bandwidth that WiFi provides. Up to four controllers can be paired to the Shield tablet for multiplayer games. Due to the addition of 5 GHz 2x2 WiFi, NVIDIA’s GameStream and GRID, which means that it’s possible to stream games from a PC within the same LAN to Shield tablet and play games by streaming from NVIDIA servers to the tablet. NVIDIA did note that only 720p is supported through WiFi, and an Ethernet connection is necessary to stream at 1080p due to latency reasons. While both GameStream and GRID are largely similar in experience compared to the Shield portable, the Kepler GPU in the Tegra K1 enables a great deal of potential for gaming. Trine 2 will ship with the tablet, and is a direct port from the console game. NVIDIA also showed off the improvements in games like Half Life 2 and Portal, which run full OpenGL rather than OpenGL ES as it did on Shield portable. Outside of feature set, NVIDIA is claiming that the K1's GPU is far faster than the GPU in either the Exynos 5420 or Apple's A7 SoC. In addition, NVIDIA showed off a full version of War Thunder running on Shield tablet, and claimed that it will be able to play on multiplayer with PCs. This included both the tank and aircraft combat aspects of the game. NVIDIA also showed that the Unreal Engine 4 demo from Google IO runs on the Shield tablet. Finally, the Shield tablet will be the first Android tablet to support streaming to Twitch. By leveraging the built in front facing camera, it’s possible to stream both gameplay and webcam/commentary. In practice, I didn’t see any noticeable issues with this system, and it seemed to work as promised. The 1.4 micron pixel size seemed to make the quality relatively acceptable even indoors. That was a lot to go over, but I think the key here will be the native gaming experience on Shield tablet. While it’s fully possible for Shield tablet to serve as a dedicated console with GameStream, the real use case will be whether it can provide a solid gaming experience using the SoC for rendering rather than as a video decoder for a PC somewhere else. With games like War Thunder and Trine 2, it seems that there is immense potential for a very compelling product. While NVIDIA isn’t starting from nothing this time around, this ecosystem aspect is still a bit risky. The Shield tablet will go on sale July 29th for the US, August 14th for Europe. The 16GB/WiFi variant will cost 299 USD, the 32GB/LTE variant will be 399 USD. The controller is priced at 59 USD, and the flip cover at 39 USD. So i don't have the device to properly measure volume, there are rounded corners and don't really know how curved the back is but we can look at the dimensions comparing a very compact tablet with this one. So very rough volume approximation based just on dimensions so excludes any curves - if anyone has real volume numbers, i would be very curious to see them. So the Shield is 45% bigger, might not look like it at first glance but it is. If that is not bulky then what is? To make things funnier the Shield tab has a smaller screen, 8 inch vs 8.4 inch and if you look at the screen area per volume (of the device) ratio it gets even worse because the screen area is 10% bigger for the Samsung - someone will point out that it's not 10% because the diagonal is just 5 % bigger but area really is 10% bigger so in volume per screen area it gets even bulkier. How is the pricing poor? The 16gb Nexus 7 is $230 and this has better performance, a bigger screen, the hdmi out and the microsd slot so you can add 128 gig to the storage and all that for only $70 more. Looks like it is well priced for what it offers.